In a recent news from the EFF, there is an increase to limit the use or block access to Usenet by some ISPs. But NNTP and Usenet can be still useful for new technologies, a nice example of a NNTP server plug-in in a wiki. In such case, you can benefit of Usenet threading using a standard Usenet client or distributing RecentChanges RSS feed in a more efficient way than regularly fetching RSS feeds via HTTP. 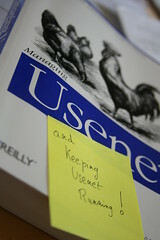 Old is new and new is old… don't kill the Usenet infrastructure that could support the next interactive business.